Description: The reticulated dragonet has a similar body shape to the common dragonet (Callionymus lyra) but tends to be much smaller, 8-10cm in length compared with 20-30cm. Both males and females have numerous pale blue spots on their sides and four dark saddle-like markings across the back. The saddle markings are surrounded by a clearly defined darker outline. 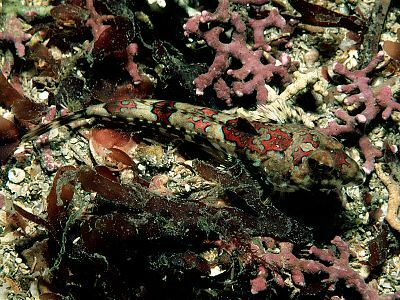 Habitat: The reticulated dragonet usually occurs on coarse sand or gravel from the low shore to 40m depth. Distribution: In the British Isles this species is restricted to southern and western coasts and the Irish Sea. Similar Species: This species is similar to the common dragonet (Callionymus lyra) but can be distinguished by the sharply defined outline surrounding the saddle markings on the back. Picton, B.E. & Morrow, C.C. (2016). Callionymus reticulatus (Valenciennes, 1837). [In] Encyclopedia of Marine Life of Britain and Ireland.